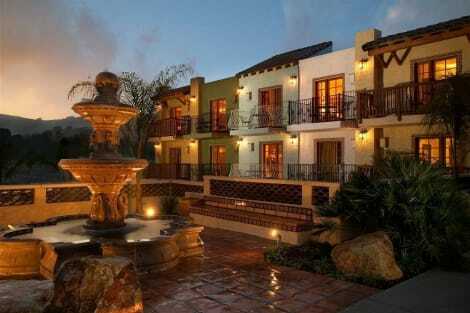 Thank you for considering Sycamore Mineral Springs Resort for your upcoming stay brbr Sycamore Mineral Springs Resort spans more than 100 acres of forest hills and meadows and is conveniently located 7 miles from San Luis Obispo Pismo beach and numerous wineries. br Each room on the property comes with its own private hot tub. Guests have the option at booking to choose a room type with either the mineral spring water which will have a sulfur odor or a room with a fresh water hot tub still mineral rich but less of the sulfur andor sulfur odor. br As a guest of the resort you will have complimentary access to any of our ongoing yoga classes 24hour bellman assistance and are invited to explore the lush hotel grounds which includes our farmtotable garden labyrinth meditation gardens walking trail into Avila Beach approx. 2 miles and a hiking trail 36 miles.br The resort also offers California style dining on site at our Gardens of Avila Restaurant serving fresh local ingredients. br The resort also features an awardwinning spa which offers massages facials and body wraps. Each treatment comes with a relaxing presoak in one of our hillside mineral spring tubs. br brOur restaurant spa and hillside tubs are all available to the public so advanced reservations are always highly recommended. Relax at the full-service spa, where you can enjoy massages, body treatments, and facials. If you're looking for recreational opportunities, you'll find an outdoor pool and a spa tub. This hotel also features complimentary wireless Internet access, concierge services, and gift shops/newsstands. lastminute.com has a fantastic range of hotels in Avila Beach, with everything from cheap hotels to luxurious five star accommodation available. We like to live up to our last minute name so remember you can book any one of our excellent Avila Beach hotels up until midnight and stay the same night.